CSS has provided technical support of several multi-year estuarine research projects at the U.S. EPA's Western Ecology Division. This work focused on developing approaches and tools to better assess the cumulative effects of multiple stressors on ecologically and economically important estuarine species and habitats in the Pacific Northwest. 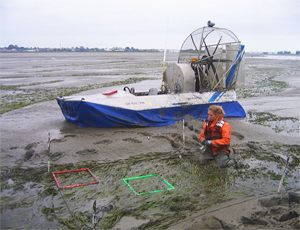 Over a 13-year period, our staff have conducted surveys of flora and fauna in intertidal, subtidal, and coastal wetland habitats in 20 estuaries in Oregon, Washington, and northern California. Our staff routinely operate a variety of watercraft, including hovercrafts and vessels ranging in length from 10 to 24 feet, and use standard transect methods in intertidal and subtidal research to characterize submerged aquatic vegetation (SAV) and benthic communities. We assisted in methods development and implementation of underwater video and sidescan sonar to map seagrass habitats in turbid estuarine waters. CSS has conducted pilot studies in coastal wetlands to test the applicability of rapid assessment methods (visual metrics of landscape and wetland buffer attributes, hydrology, and physical and biotic structure) and more intensive candidate indicators for assessing wetland condition (such as measurements of vegetation cover by species). Sediment cores or grabs are routinely collected for identifying and enumerating benthic invertebrates, and as particle size and chemical analyses. We have seined in tidal channels and operated and maintained acoustic tracking equipment to determine salmonid use of estuarine habitats.